Arthritis of the ankle - wear of the ankle - typically affects younger patients. The ankle is actually less susceptible to arthritis than the hip or knee. Therefore, arthritis developing in the ankle is usually promoted by specific causes, typically accidents. Only 5% - 10% of all cases of arthritis of the ankle occur as primary arthritis of the ankle, i.e. without specific cause. How does arthritis of the ankle feel? With arthritis of the ankle, the patient feels as though he or she first has to "warm up the ankle" after a period of sitting or resting. The joint is "stiff" and frequently swollen as well. It is also not able to handle strain as well any more: Following physical strain, the ankle afflicted by arthritis is still sore and swollen days later. The quality of life declines greatly, as ankle pain increases whilst walking, when suffering from arthritis of the ankle. Movement accompanied by shock to the joint, such as jogging or playing tennis, becomes totally impossible. The ankle aches and stiffens. Arthritis of the talocalcaneal joint is also a widespread disease. In the final stages of arthritis, the ankle is painfully stiff. It is then replaced with an ankle prosthesis or stiffened through arthrodesis. This allows the patient with severe arthritis of the ankle to remain mobile in everyday life. Over 90% of cases of arthritis of the ankle are therefore the result of an injury, i.e. secondary arthritis of the ankle. In the following article, we would like to present the primary causes of arthritis of the ankle. We will also present treatments we can use, to stop or greatly slow down joint deterioration. The objective: Preventing a loss of the quality of life. By treating the damage caused by the accident, we are able to treat the arthritis of the ankle whilst preserving the joint at an increasing rate. Modern cartilage replacement can even heal early cartilage damage and stop joint degeneration. This cartilage regeneration has become a reliable treatment. Cartilage investigation: Cartilage, forming the joint-space in the x-ray image, is the lubricating layer between the bony parts of the joint. Bone tissue beneath the cartilage. Ligaments and tendons guiding the joint. Connective-tissue membrane (synovial membrane, which creates the synovial fluid). The term arthritis is a collective term for signs of wear in joints. Similar to the term "stomachache" not stating the cause of the pain, "arthritis of the ankle" also makes no indications on the specific cause of the joint disease. However, the physician is often able to determine the cause of the ailment. This could for example be a loose body, a misalignment of the leg axis, a ligament injury. Consequently, arthritis of the ankle can have an array of different causes. But these different causes and courses of the disease merely share the same end stage: The deterioration of the ankle joint through the depletion and deterioration of the cartilage layer on the joint surfaces. Who gets arthritis of the ankle? How common are sports injuries of the ankle? Arthritis of the ankle is relatively rare compared to arthritis of the hip and knee. On average, the patient afflicted by arthritis of the ankle is significantly younger than other arthritis patients. The cause is usually trauma, i.e. related to accidents. This results in defective positions and hyper flexibility of the ankle, and later arthritis. Treatment is therefore strongly based on orthopaedics and trauma surgery: The exact analysis of the defective positions and restoring the weight bearing axis is always the basis for joint-preserving ankle treatment. Without further analysing the circumstances for arthritis of the ankle developing, we can only treat the symptoms, so alleviate arthritis pain. Overstressing the ankle due to sports or being overweight. Defective positions and dysfunction of the leg axis due to defective positions (club foot, flatfoot). Defective position following an accident. Neurological causes, e.g. polyneuropathy or nerve damage. Metabolic causes: gout, haemochromatosis, diabetes mellitus. The upper ankle joint is frequently afflicted by arthritis following accidental damage. Accidental damage includes ligament damage of the upper ankle joint after twisting the ankle as well as joint damage following ankle fractures. It can also occur if fractures away from the ankle joint heal in a defective position. This results in a constant incorrect weight bearing of the cartilage in the ankle. This damage typically only develops over years In addition to acquired causes, there also are inherent causes for arthritis of the ankle: Congenital club foot, flatfoot or hollow foot. Lateral ruptures of the ankle are now - rightfully so - treated by immobilisation via brace. For about 20% of all patients this immobilisation does not suffice: Ligament instability remains. Especially in lateral ligaments this results in "rotation instability" of the ankle bone, which can especially cause arthritis of the ankle in patients with high levels of strain due to sports or their profession. Of course this must be diagnosed years or decades before arthritis of the ankle appears, in order to be helpful. But even in patients with arthritis, this test is an important component in the diagnosis. In most cases this residual instability of the ankle joint doesn't even require surgery. Targeted physical therapy and at ankle exercises at home from the ankle academy can quite often correct this instability. In few cases this instability requires surgery. 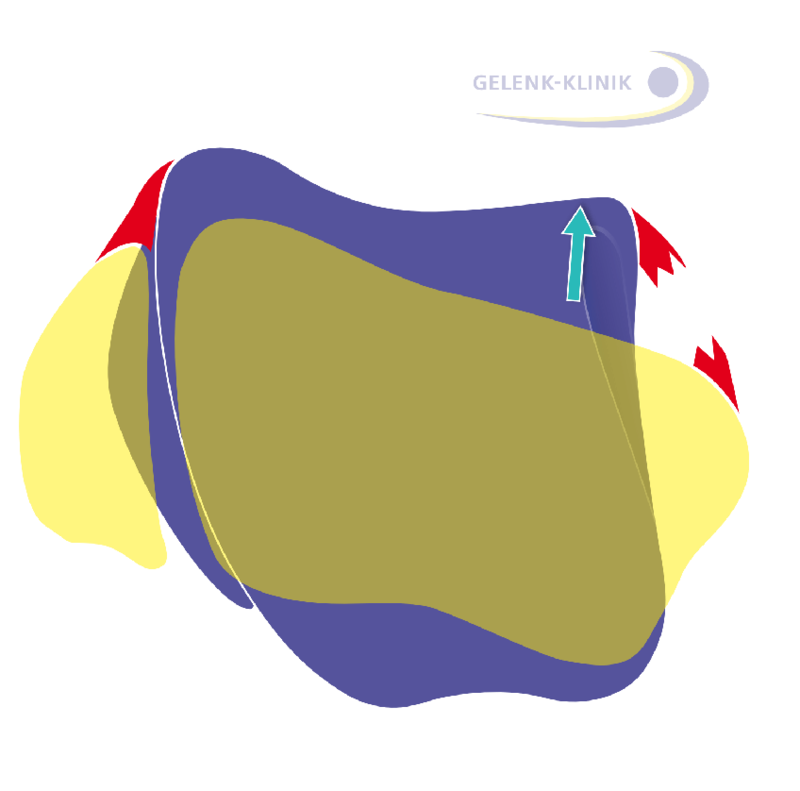 Unfortunately, with extremely conservative treatment of lateral ligament ruptures, the follow-up examination to determine such residual instabilities in a time period in which they could still be treated is often not carried out. The following images are diagrams of the talus (ankle bone) viewed from the top. The shin (tibia) and calf bone (fibula) forming the joint are marked in yellow. The ankle bone bears a person's full body weight when walking. However, there are no muscles actively keeping the ankle bone itself in position. Only ligaments secure the talus in position. 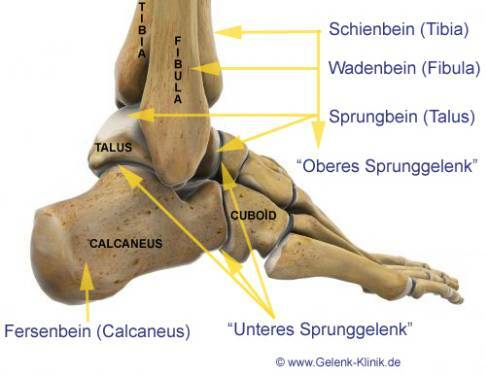 Only the position of the surrounding ligaments and joints define the properties of the ankle bone key for the formation. This connection is our primary focus in examining arthritis of the ankle. Why does ligament instability cause arthritis? Loose ligaments and tendons result in the ankle no longer being guided properly. The joint bones are no longer ideally positioned together. The cartilage is strained in some areas of the joint and rubbed off. That is, the cartilage is lost. The loss of joint space intensifies the defective position: It creates a vicious circle. Just as with other joints, the wear leads to depletion of cartilage - and consequently narrowing of the joint space. The so-called joint space is the invisible cartilage layer in the X-ray. If it's still pronounced, the joint-forming bones in the ankle maintain a distance: They form the joint space. If the joint space shrinks due to cartilage abrasion and arthritis, stress to the adjoining bone and cartilage abrasion increase. More and more of the cushioning function of the joint cartilage in the ankle is lost. The consequence is inflammation including swelling of the ankle. Protruding bone (bone spur or osteophytes) forms at the edges of the ankle, where the bones rub together and crunch as the joint space becomes more narrow in the ankle. These bone spurs are a result of the cartilage damages and mark the transition to arthritis of the ankle. Fig. 9 (LEFT): The bone surfaces in the ankle are no longer congruent. 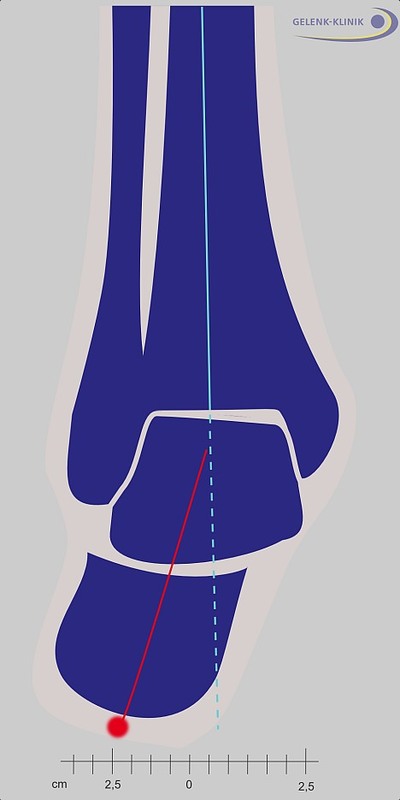 Due to the slant, only the inner (medial) part of the ankle bone from below bears weight. Arthritis can form here due to overstressing. Fig. 10 (CENTRE) The defective position of the ankle is also visible from outside. 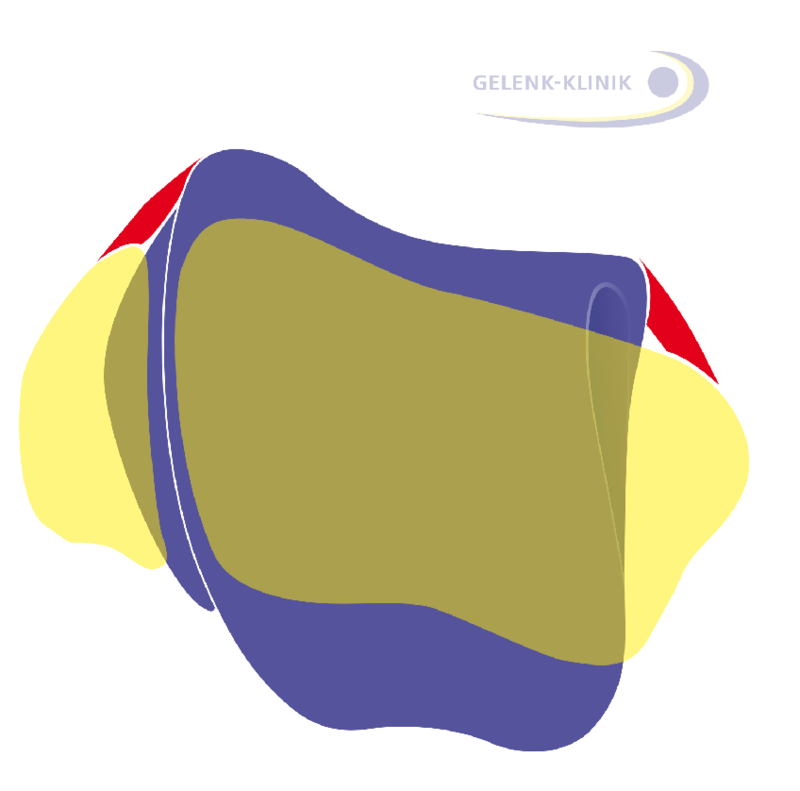 Also shown in yellow is the altered direction of movement of the Achilles tendon. This strongest tendon in the human body intensifies the defective position by deviating from the static stress axis. Fig. 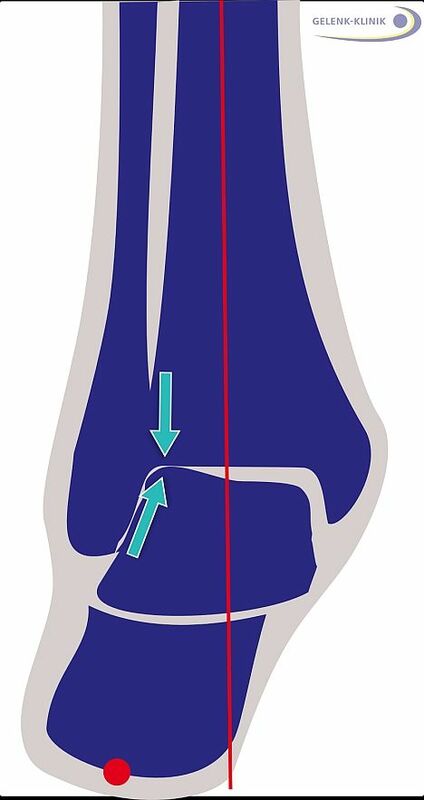 11 (RIGHT) Shown in red is the normal axis of the ankle. Different causes can result in a variance which can cause arthritis of the ankle due to incorrect weight bearing. Why is arthritis of the ankle less frequent than arthritis of the knee? Cartilage in the ankle is more durable to degrading enzymes. Cartilage in the ankle is able to regenerate slightly better than in the knee. The talus fits precisely into the talar mortise: Joints with a higher congruency of the joint parts are more resilient to arthritis. Conservative (non-surgical) treatment of arthritis of the ankle is an attempt to delay progression of the disease. The target of this treatment is usually to increase joint stability. Physical therapy, particularly a special ankle academy, can improve the behaviour of the ankle by strengthening the muscle and improving coordination. Physical therapy can also improve cartilage regeneration following cartilage damage. Another very effective means is orthotics. Raising the outer or inner edge or using insoles can improve the course of movement and optimise the position of the joint. Depending on the cause of the diagnosis, different surgeries can also help to slow progression or correct the damage. Grade 0: Healthy, lubricated cartilage. Grade 1: Chondromalacia, disorders of the cartilage structure. Grade 2: Moderate disorder of the connective tissue in the cartilage. Grade 3:Lacerations in the cartilage surface, roughening. Grade 4: Bones are no longer covered in cartilage. Arthritis of the talocalcaneal joint is the result of the disease progressing over years. In the beginning there's always damage to the joint cartilage. After this initial damage to the joint cartilage, resilience to stress is reduced. The surface is considerably less rougher than healthy cartilage, thus resulting in increased cartilage abrasion in the joint. The colour of the joint cartilage changes from white to a shade of yellow. Fig. 12: Arthroscopic photograph of the joint cartilage in a patient's ankle shows cartilage damage in the ankle. Initially this reduced resilience is only noticeable with high stress (contact sports, football, tennis). But later, even typical everyday use can result in increased cartilage abrasion. The friction between smooth cartilage surfaces in a healthy joint is only a fraction of the friction of two ice cubes rubbing together. The roughening or the complete breakdown of the cartilage surface greatly increases friction. Over time, in addition to the sliding function, the cushioning function of cartilage in the ankle is also lost. The abraded particles of cartilage support the wear, since the damaged cartilage is further damaged by an inflammatory reaction in the joint. This results in increased stress on the adjoining bone as the cushioning of the cartilage declines. This forms bone spurs (osteophytes) in the ankle, which progressively limit the joint's mobility. Arthritis of the ankle as a result of an accident. Arthritis of the ankle due to rheumatism. Arthritis of the ankle related to infection. Arthritis of the ankle resulting from paralysis. The cause of primary arthritis of the ankle is unclear. It appears spontaneously without trigger or identifiable causes. Primary arthritis of the ankle is actually very rare. The causes of primary arthritis of the ankle are still widely unclear. It may actually also be traumatic impacts with cartilage lesions. Secondary arthritis of the ankle can have various causes. It is typically due to an accident (trauma). Start-up pain (warming up the joint). 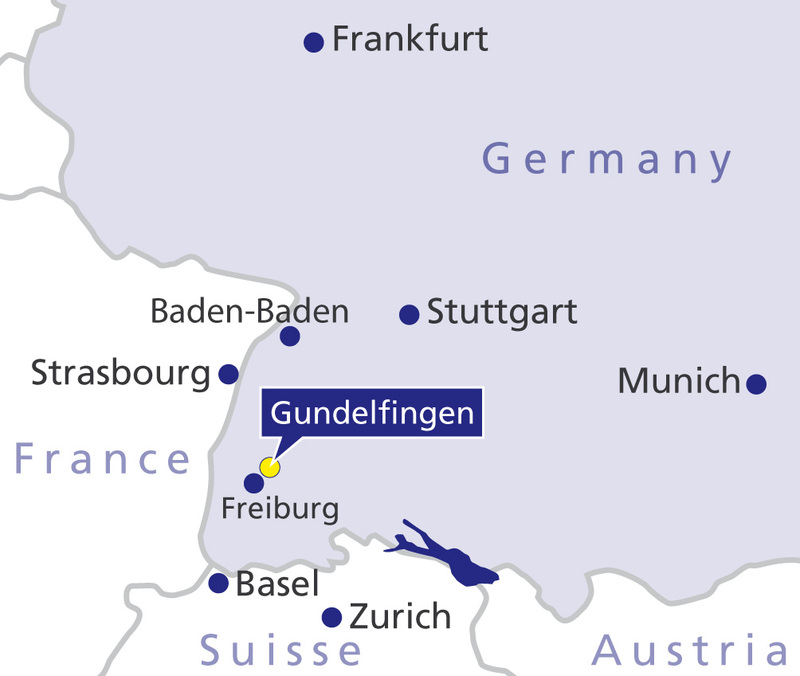 Reduced walking distance (weight-bearing pain). Obstructions in the joint due to impingement of soft parts, cartilage and bony parts in the joint. Painful walking on uneven ground or terrain. During the medical consultation, severe ankle pain and swelling are usually mentioned as the reason for the visit. Pain still occurring depending on strain, so immediately after sports or after a hike, indicates an early stage of arthritis of the ankle. Resting pain and persistent pain in the ankle indicate advanced arthritis of the ankle to the physician. Another indication of arthritis of the ankle is rapid fatigue with strain. The ankle disease initially only causes occasional ankle pain in the afflicted person after straining the leg more than usual. Ankle problems become more frequent as the disease progresses and the resilience to stress declines. The flexibility of the ankle is reduced by recurring inflammation of the joint capsule and resting the foot due to the pain results in limping. Depending on the severity of the damage in the ankle, different problems may arise. In the early stages, typical problems with the ankle related to arthritis are occasional pain or fatigue in the ankle. Morning start-up pain or ankle pain after extended periods of rest are relatively typical. Pain in the ankle after strain or even resting pain only occur as the arthritis progresses. The ankle pain increasingly reduces the afflicted person's quality of life. The walking distance decreases, the exercise capacity during sports declines noticeably. Arthritis of the ankle noticeably limits everyday and work activities.Restrictions of movement of the ankle and relieving postures routinely result in problems radiating into the foot or the lower leg. Defective position of the hind foot, i.e. the heel. The flatfoot is also accompanied by outside rotation of the heels. In addition, an outside rotation of the longitudinal axis of the foot starting at the tarsus along the line between the ankle bone and tarsus is observed. The heel bone also tilts to the outside in response to this defective position. During the medical examination, the physician inspects the leg axis from the front and back. Defective positions in the ankle are particularly important: Inward or outward defective positions of the heel bone are important. The condition of the arch is also examined. A flatfoot (pes planovalgus) can be accompanied by an outside rotation of the heel bone (so-called valgus position of the hind foot). Therefore, hereditary or defective positions acquired due to an accident can promote arthritis of the ankle. Consequently, the physician will ask about accidents or past foot pain during the appointment. Fig. 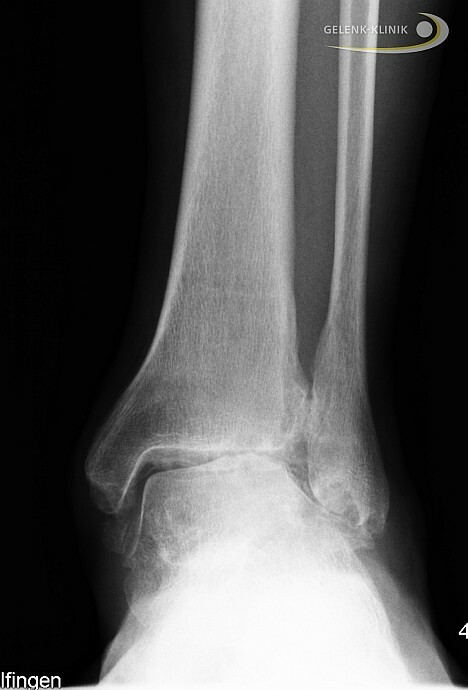 13: X-ray of arthritis of the ankle (lateral). The joint space between the talar mortise and the ankle bone is no longer apparent. The cartilage layer is completely worn away. X-rays with the leg bearing weight are very helpful in diagnosing arthritis of the ankle. An assessment of arthritis of the ankle using X-rays without bearing weight is incomplete. These images show the axis condition and the spread of cartilage damage in the ankle whilst providing information on the cause of arthritis. The so-called hind foot alignment view is helpful in assessing the impact of the defective position of the hind foot: It shows the alignment of the heel bone. This allows for a conclusion on the role of defective hind foot positions in arthritis of the ankle developing. In addition, weight bearing views of the foot are taken, to determine the severity of the accompanying arthritis in adjacent joints of the ankle. 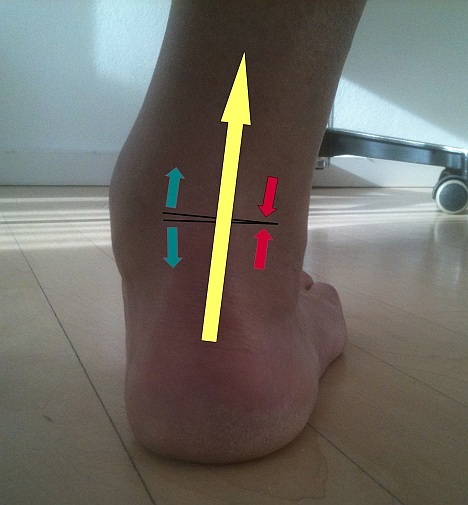 Here, the position of the medial arch is also important: Flattening of the arch in a flatfoot as well as a converse variance in hollow foot are considered consequences of the health of the upper ankle. Full leg views to assess the entire leg axis and its impact on the ankle are - not only prior to repositioning or prosthesis surgeries - helpful and necessary. How does the specialist see arthritis of the ankle in the X-ray? 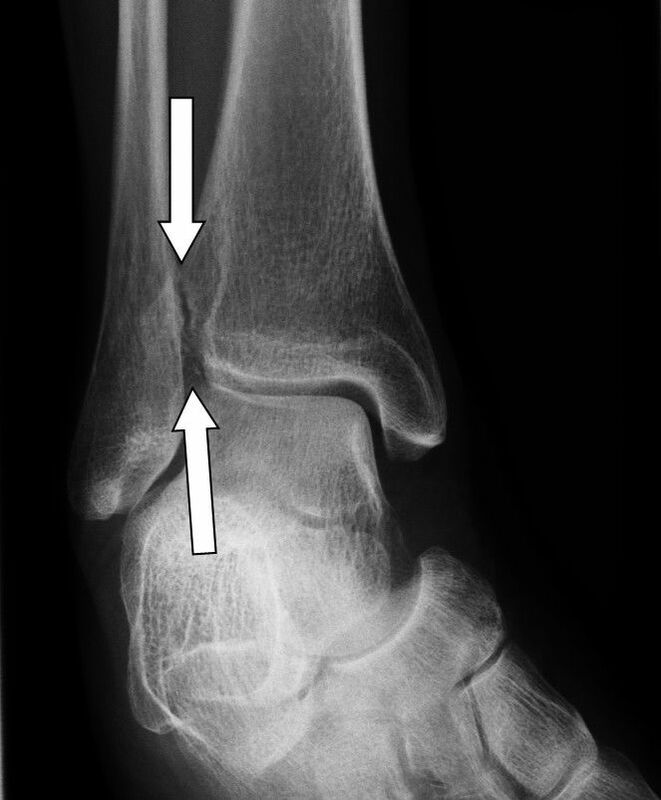 Early signs of arthritis of the ankle in the X-ray: A narrowing of the ankle joint is an indirect sign of cartilage damage, thus an early sign of arthritis of the ankle. Due to the cartilage damage, an adjustment response occurs in the bone near the subtalar joint. Hardening of the bone (sclerotisation of the bone) in the ankle is the result of cartilage depletion. 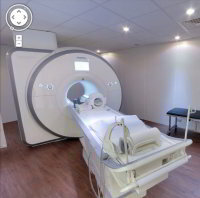 The SPECT scan can provide information on the bone remodelling processes resulting from the load distribution. Fig. 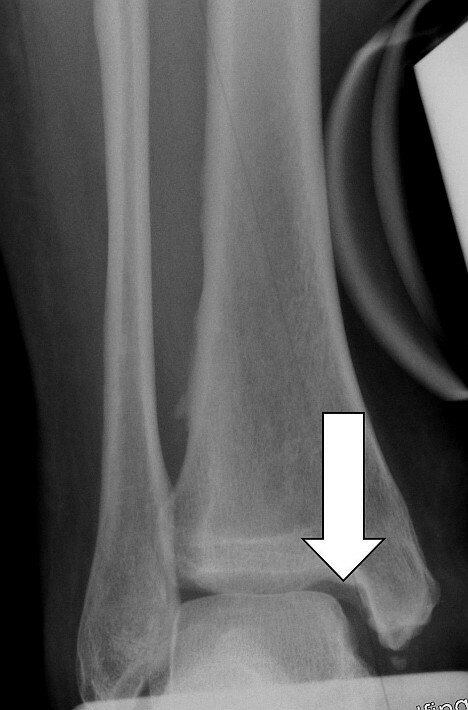 16: Arthritis of the ankle in the X-ray. The reduced joint space is distinct and visible. 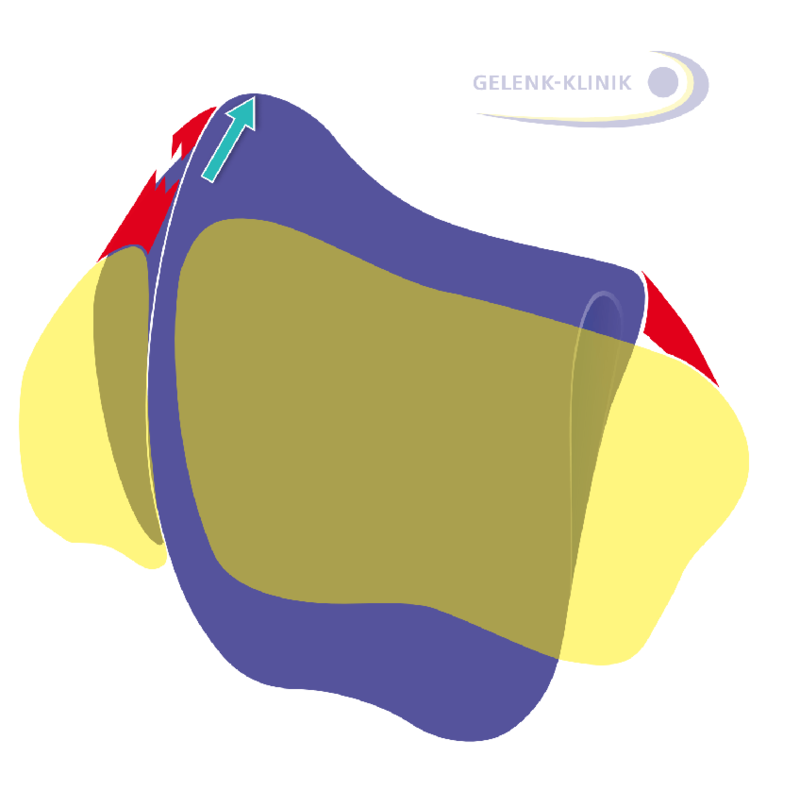 The cartilage layer is noticeably reduced, decreasing the gliding property and cushioning properties of the joint. The joint space of the ankle disappears more and more, and the bone near the joint hardens more and more until the edge of the bone responds to the increased strain by forming bone spurs, so-called osteophytes. Over the course, the increased pressure in the bone can result in bone disintegration, so-called subchondral cysts (or geodes). These are cavities in the bone due to the bone dying (osteonecrosis). A final sign of arthritis of the ankle, the opposing bones in the joint deform since the weight bearing lines of the joint change. A flattening of the ankle bone (talus) often occurs in the upper ankle and the bone increasingly sliding forward. These variances cause increasing restrictions, which can then further impact the adjacent joint. Improving metabolism promotes cartilage regeneration. Improving perception of body position (proprioception) prevents further ankle twisting and injuries. Strengthening the muscles improves the behaviour and stability of the ankle. Straightening the leg axes reduces cartilage-damaging strain. Correcting a defective position of the hind foot prevents unilateral wear of the cartilage layer. Treating pain and inflammation improve the course of cartilage-damaging inflammation in the case of activated arthritis of the ankle. First priority is the non-surgical treatment of the arthritis of the ankle. The recommended treatments depend on the stage of the arthritis of the ankle. The goal of all of these measures is to slow or stop the progression of arthritis. In order to understand mechanisms of action of conservative treatment, we need to go back to the above circumstances of how arthritis of the ankle developed. All the available conservative methods of treatment are not intended to do "anything”, which may help. Rather they are intended to specifically influence the mechanisms of arthritis developing. So every conservative treatment method has a meaningful place in an overall concept. It is also not sensible to differentiate between surgical and conservative treatments. Both types of treatment have one goal: Improving the congruency (fit) and stability of the ankle, to slow or stop the course of arthritis. Therefore, we would like to introduce you to all conservative and surgical methods from a perspective of stabilising the ankle whilst explaining the specific benefit in a comprehensive strategy for treating arthritis of the ankle. This will also make it clear that we need to find a suitable treatment concept based on the specific stage of your arthritis of the ankle and your specific circumstances. Even with surgical methods, a stable, pain-free ankle can only be achieved if you base your lifestyle on the principles of the ankle academy in the long term. To do so, you will need to understand the principles for maintaining a healthy ankle, or for arthritis developing due to improper weight bearing. 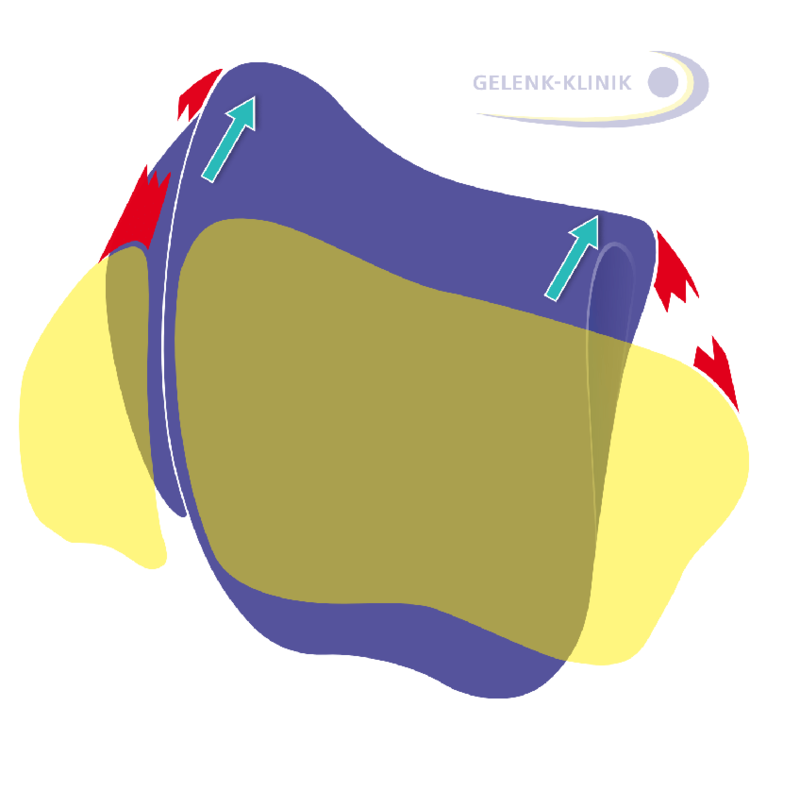 For this reason, we developed a simple, easy to follow ankle training programm for our patients, which you can practice and learn in our Gelenk Reha physical therapy. Goal of this exercise: Improving coordination and protective reflexes in the ankle. 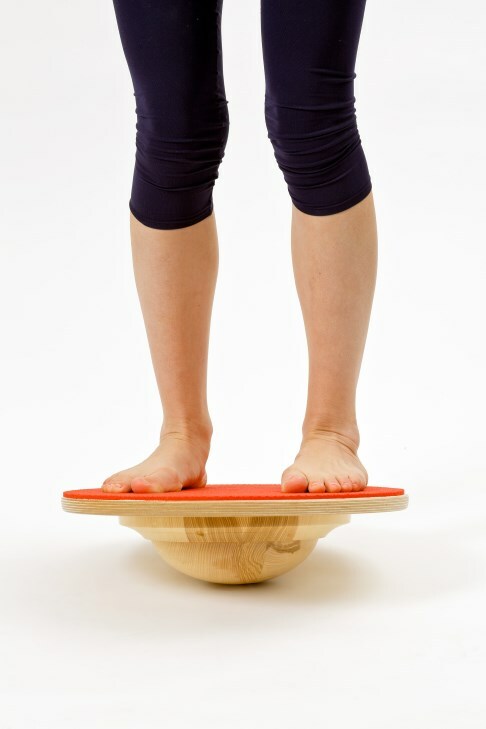 Starting position: Stand on the balance board, legs hip-width apart. Exercise: Balance your weight on the top. Please note, an independent at-home exercise program for ankle instability, ankle pain and arthritis of the ankle is only recommended after a thorough medical examination, diagnosis and after receiving instructions from our physical therapists. We must ensure the exercises are suitable for your condition. You will then receive the exercises specific to your case during instruction by the physical therapist as your personal exercise program. In addition, medication using anti-inflammatory pain relievers, so-called anti-rheumatics or NSAIDS (e.g. Diclofenac) is also an option. Take a pain reliever and an anti-inflammatory. But not daily without caution. Do not take regularly in the morning but try to take them as pain develops with everyday activities. Physical therapy is also conducted and shoe alterations are prescribed (e.g. rocker sole, rocker-bottom shoe). We also try to delay the depletion of cartilage by injecting cartilage-building compounds. This is particularly advisable in early stages of arthritis: For an optimal effect, we try to place these compounds optimally in the ankle with the help of ultrasound during injection. After exhausting conservative measures, surgical measures may be considered for treatment if the goal of treatment has not yet been achieved. In most cases, conservative treatment suffices in treating arthritis of the ankle. However, if problems with the ankle continue, ankle surgery will need to be planned. But even with successful surgery, arthritis can only be treated with long-term conservative follow-up treatment of the ankle. Physical therapy at the ankle academy will still be necessary after successful ankle surgery. Goal of the exercise: Improving flexibility and strength in the upper ankle. Starting position: Sit on a chair with your foot touching the floor. Exercise: Slowly roll your foot to the tips of the toes, briefly hold pressure there. Return your whole foot to the floor and draw the tips of the toes up toward the body. We see chronic instability of the ankle in 20% of patients following an injury of a ligament. Especially in athletes, this can have repercussions due to the permanently increased susceptibility for injury. Ligament instability holds the risk of repeated sprain trauma. Even a mere increase in the play of the joint, i.e. reduced congruence of the joint surfaces, can result in ankle degeneration. The injuries this causes often result in arthritis of the ankle. However in many cases, special exercises can train the protective reflexes and prevent future twists. 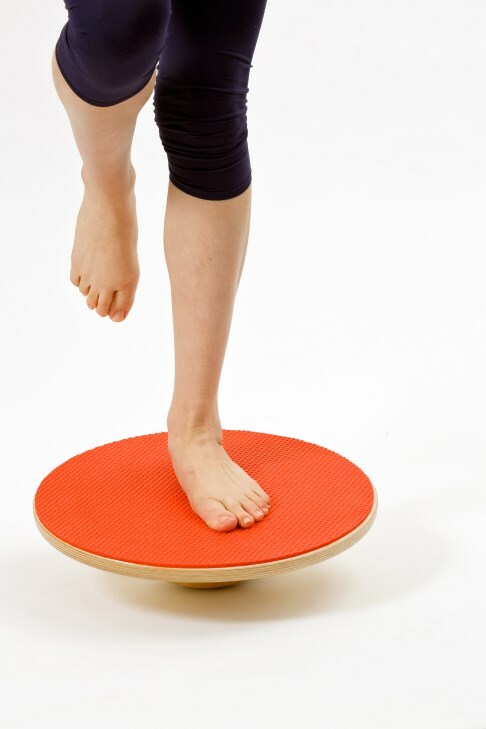 In addition to the "balance board" (see above), there are a number of exercises to strengthen the stabilising muscles, promote self-awareness and make the ankle more stable in the long term. Even after surgical ligament reconstruction, these exercises help stabilise the ankle. Orthopaedic shoes and insoles improve the ankle's roll-off pattern. Defective positions can e.g. also be compensated by raising the outside or inside edge of the shoe. Insoles and orthopaedic shoes can thus alleviate ankle pain and stop the course of the disease. In addition, the ankle can be supported from the outside using an arthrodesis boot. Especially in the early stage of arthritis of the ankle, orthopaedic aids can noticeably reduce arthritis pain and improve overall articulation in the ankle. Just as conservative treatment, surgery also aims at improving the stability of the ankle, thus treating the cause of arthritis of the ankle. In the process, all surgical methods are used, which can improve how muscles and tendons guide the joint mechanically. As we learned earlier, arthritis of the ankle is augmented by deviations in the leg axis or defective position in the ankle. Therefore, corrections restoring the ankle axis or correcting an asymmetric position of the ankle bone in the talar mortise always preserve the joint or at least delay arthritis. Abrasion arthroplasty:Removing destroyed cartilage surfaces and rough cartilage. Microfracture technique of the ankle: : Drilling into the bone below the cartilage, the healing reaction this triggers can form scar tissue as a substitute substitute for cartilage. Cartilage transplant in the ankle: Transplanting the body's own cartilage cells grown outside the joint. Correcting the axis (osteotomy) of the lower leg or heel: Correcting the bone above or below the ankle can correct the leg axis; defective positions are corrected. Ligament reconstructions of the ankle: The stability of the lateral ligaments is important to joint function. Implanting an ankle prosthesis: This preserves your gait and the normal movement pattern of the ankle. Ankle fusion surgery: The fusion can stabilise the ankle without pain, even under high everyday strain. Here, the ankle prosthesis, which preserves the gait compared to the once standard ankle fusion, is gaining importance in patient care. Treating impingements in the ankle. The most direct surgical technique for inspection and minimally invasive treatment of the ankle isankle arthroscopy. With this keyhole surgery, only small skin incisions (approx. 1 cm) are made around the ankle. which are used to insert arthroscopes with instruments and small camera probes (endoscope) into the joint. An arthroscopic procedure of the ankle allows us to inspect the state of the joint directly and determine the condition of ligaments, bones and cartilage with a direct camera image. Due to the small superficial incisions, the wound can heal quite rapidly after an ankle arthroscopy. Scarring is very minimal. This procedure allows for gentle surgical treatment of the arthritis of the ankle with little complications. Joint preservation or joint replacement? The sturdy 3rd generation ankle prostheses were introduced in the mid ‘90s. Since then, specialists have learned much about the factors, which keep the ankle prosthesis stable. These circumstances were then increasingly treated with so-called complementary procedures prior to the surgery. This showed that for many patients, where not long before arthrodesis (fusion) would have been recommended, the same procedures could even be used to treat and preserve the joint. For these patients, the use of complementary procedures were often able to even maintain the natural ambulatory ability permanently or for several years for arthritis of the ankle. Correcting the accompanying variances, which typically trigger arthritis, is critical for preserving the joint - just as for joint replacement - in patients afflicted by arthritis of the ankle. Treating accompanying variances (defective position, ligament damage or correcting the talar mortise) is elementary for a prosthetic fitting: These surgical corrections of the ankle can prevent premature release of the ankle prosthesis. 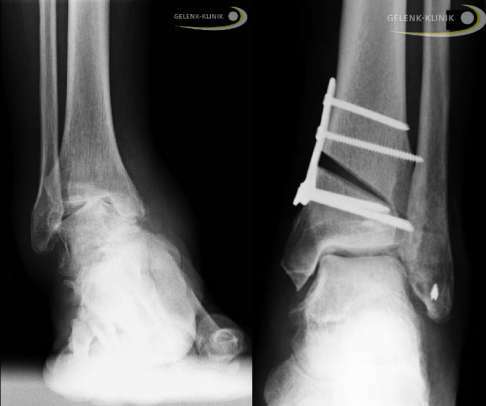 Even many malpositioned and unstable joints can be successfully treated with an ankle prosthesis once the complementary procedures have been performed. The complex impacts defective positions of the foot have on the upper ankle prosthesis require a lot of experience. Bone procedures above or below the ankle may be required. In the event of a defective position of the foot (flatfoot), correcting the tarsus bones by removing a wedge or extension can be helpful. Surgical joint preservation instead of fusion or ankle prosthesis? The defective position observed in the ankle. Even correcting accompanying variances will have a positive impact on the arthritis in the ankle. The potential of joint preserving procedures has advanced greatly in connection with modern osteosynthesis (surgical fastening) and bone treatment(bone transplant in the ankle). After treating accompanying conditions, many patients can in practice ultimately do without ankle prosthesis or fusion. Avoiding or delaying a prosthesis or fusion can be beneficial to our patients for many years, sometimes their entire life. Stabilising and regenerating damaged bone surfaces. Ligament stabilisation and ligament reconstruction. Normalising the leg axis through repositioning (osteotomy) of the heel bone or the ankle bone. In addition to the stability of the tendons and ligaments, congruency in particular, i.e. a precise fit between the ankle bone and talar mortise, is an important aspect. If the talus (ankle bone, the bone in the ankle joint on the food end) is not quite straight, some areas of the ankle bone and the talar mortise are overstressed. Other areas are not bearing weight at all. In the overstressed areas the cartilage is permanently damaged. Arthritis develops on the mechanically overstressed surfaces of the ankle.